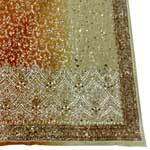 If you are looking for the best Crepe Sarees Manufacturers and Suppliers in India, then Roshan Enterprises is a name for you. Evoking a traditional beauty, our Embroidered Crepe Sarees are sure to leave an everlasting impact on the mind of the onlookers. The richness of tradition and eternal mystique of our Crepe Heavy Embroidered Sarees provide an enchanting look to the wearer. 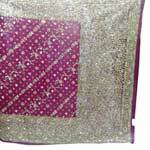 Our Crepe Heavy Embroidered Sarees are embellished with intricate embroidery that allures the fashion cautious ladies. 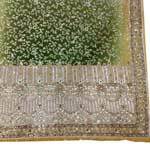 We have firmly positioned ourselves as the most preeminent Designer Embroidered Sarees Manufacturer and one of the distinguished Suppliers of the same. Being so, we are capable enough to meet the urgent as well as bulk requirements of the clients, from Delhi, Kolkata, Agra, Punjab, etc., on time. Moreover, we provide our sarees at the most competitive prices and definitely cheaper than others that too without compromising on their quality.